Lift-A-Cask from A-Cask the Cellar Equipment Specialists. 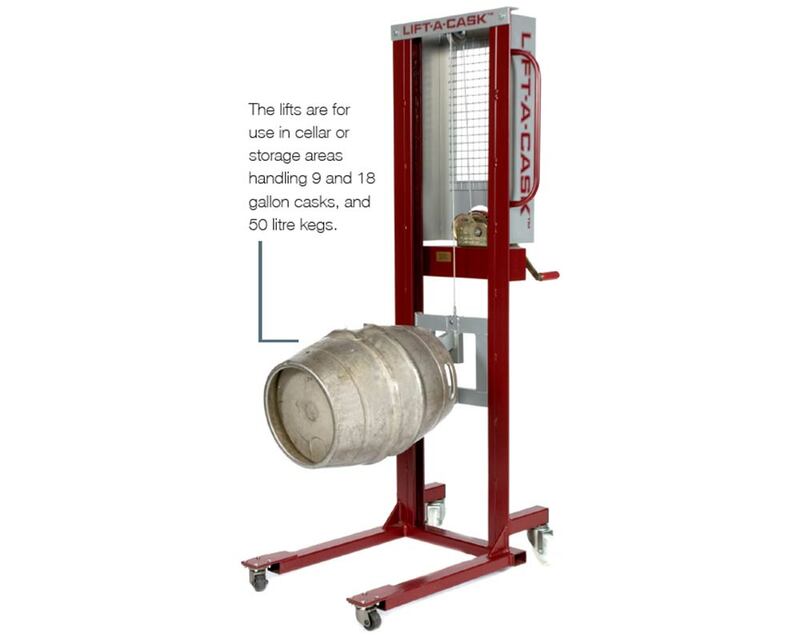 The A-Cask lift reduces bending and straining using a unique grappling device to lift and position casks and kegs effortlessly. The advanced design uses the lip on the cask or keg to raise and support during lifting – unlike other lifts that use dangerous fork lifting devices not intended for casks, kegs or cellar work. Minimum training is required and all tilts conform to Manual Handling Regulations. The lifts are for use in cellar or storage areas handing 9 and 18 gallon casks, and 50 litre kegs. Dimensions: 480mm Width x 840mm Depth x 1760mm Height. As a leading UK manufacturer of cellar racking, we are able to offer bespoke systems. We can supply hoist systems which alleviate manual handling, offering a simple way of racking casks.